With the very fast and diverse technology we have today, your iPhone has the capacity to record voice memos with just few scrolls and clicks. However, when more and more voice memos have been stored in your iPhone, you found that they took up too much storage space, and you can't to store other important files because the limited capacity of iPhone. What's more, there are always unexpected storms, for the voice memos stored in iPhone are not completely safe because they may get lost for various reasons, like accidental deletion, system upgrading, virus attack, device formatting, the lots of the iPhone, etc. All in all, the best way to solve the problem is to backup them to computer, so that we can continue to record something else and avoid the forever lost of the data. 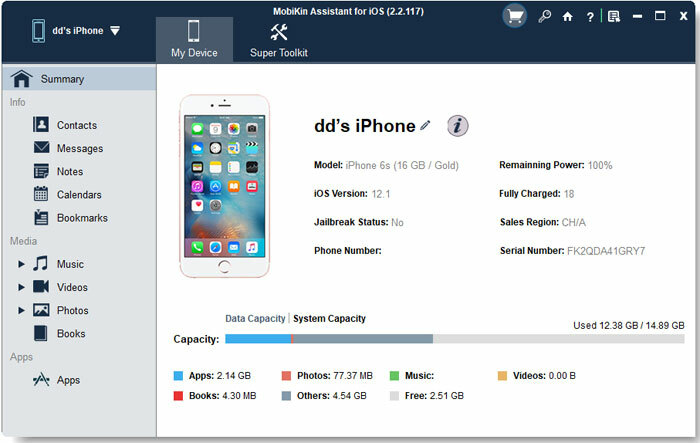 As it is known to all, you can backup all your iPhone contents to iCloud, but this method are not highly recommended here because you can't play and share the voice memos on your computer individually. Thus, you need to find another way to achieve the goal of transferring iPhone voice memos to computer for backup, that's why MobiKin Assistant for iOS (Windows Version) and MobiKin Assistant for iOS (Mac Version) comes here. It is a standalone desktop application, which is specially designed for Windows and Mac user to copy Voice memos from iPhone 6/5/4S/4 to PC or Mac in a matter of seconds respectively. And all exported file will be saved in the original quality. OK, let’s read the following guide demonstrating how to copy voice memos from iPhone to computer on PC. To perform the transferring process, firstly you need to download, install and open the iPhone Memos Transfer on your PC. Then, connect your iPhone 6, iPhone 5S/5C/5, iPhone 4S/4 to your personal computer through the USB cable. Wait for a little while, you'll get an interface showing some information about your device, including the type, capacity, system version, serial number of your device. Note: If the program can't detect your device at once, you can click "Refresh" button to check again. In addition, you need to ensure you have installed and launched the iTunes on your Windows or Mac computer. Next, click "Music > Voice Memos" category displayed on the left column to get a preview of all voice memos on your iPhone. If you wish to copy them selectively, choose the files needed and hit "Export" to export them from iPhone to your computer. Otherwise, select all files with "Check All" option to backup all voice memos. Here, you also can hit click the image button of hook on the top menu to select the whole files at one time, then you can export and save the iPhone voice memos to desktop computer in a batch. That's the whole settings of transferring iPhone voice memos to computer, very easy, right? If you're a Mac user, you can get the Mac version and follow the same steps on your Mac computer by yourself! What're you waiting for? Just get the free trial version to experience the powerful functions now!